Dracunculiasis, also called Guinea-worm disease (GWD), is an infection by the Guinea worm. A person becomes infected when they drink water that contains water fleas infected with guinea worm larvae. Initially there are no symptoms. About one year later, the person develops a painful burning feeling as the female worm forms a blister in the skin, usually on the lower limb. The worm then comes out of the skin over the course of a few weeks. During this time, it may be difficult to walk or work. It is very uncommon for the disease to cause death. In humans, the only known cause is Dracunculus medinensis. The worm is about one to two millimeters wide, and an adult female is 60 to 100 centimeters long (males are much shorter at 12–29 mm or 0.47–1.14 in). Outside of humans, the young form can survive up to three weeks, during which they must be eaten by water fleas to continue to develop. The larva inside water fleas may survive up to four months. Thus, in order for the disease to remain in an area, it must occur each year in humans. A diagnosis of the disease can usually be made based on the signs and symptoms of the disease. Prevention is by early diagnosis of the disease followed by keeping the person from putting the wound in drinking water to decrease spread of the parasite. Other efforts include improving access to clean water and otherwise filtering water if it is not clean. Filtering through a cloth is often enough. Contaminated drinking water may be treated with a chemical called temefos to kill the larva. There is no medication or vaccine against the disease. The worm may be slowly removed over a few weeks by rolling it over a stick. The ulcers formed by the emerging worm may get infected by bacteria. Pain may continue for months after the worm has been removed. In 2015 there were 22 reported cases of the disease and in the first half of 2016 there were 7 confirmed cases. This is down from an estimated 3.5 million cases in 1986. It only exists in 4 countries in Africa, down from 20 countries in the 1980s. It will likely be the first parasitic disease to be globally eradicated. Guinea worm disease has been known since ancient times. It is mentioned in the Egyptian medical Ebers Papyrus, dating from 1550 BC. The name dracunculiasis is derived from the Latin "affliction with little dragons", while the name "guinea worm" appeared after Europeans saw the disease on the Guinea coast of West Africa in the 17th century. Other Dracunculus species are known to infect various mammals, but do not appear to infect humans. Dracunculiasis is classified as a neglected tropical disease. Because dogs may also become infected, the eradication program is monitoring and treating dogs as well. Dracunculiasis is diagnosed by seeing the worms emerging from the lesions on the legs of infected individuals and by microscopic examinations of the larvae. As the worm moves downwards, usually to the lower leg, through the subcutaneous tissues, it leads to intense pain localized to its path of travel. The painful, burning sensation experienced by infected people has led to the disease being called "the fiery serpent". Other symptoms include fever, nausea, and vomiting. Female worms cause allergic reactions during blister formation as they migrate to the skin, causing an intense burning pain. Such allergic reactions produce rashes, nausea, diarrhea, dizziness, and localized edema. When the blister bursts, allergic reactions subside, but skin ulcers form, through which the worm can protrude. Only when the worm is removed is healing complete. Death of adult worms in joints can lead to arthritis and paralysis in the spinal cord. Dracunculiasis is caused by drinking water contaminated by water fleas that host the D. medinensis larvae. Dracunculiasis has a history of being very common in some of the world's poorest areas, particularly those with limited or no access to clean water. In these areas, stagnant water sources may still host copepods, which can carry the larvae of the guinea worm. Humans and dogs are the only known animals that guinea worms infect. Other species in the Dracunculus genus affect other mammals. After ingestion, the copepods die and are digested, thus releasing the stage 3 larvae, which then penetrate the host's stomach or intestinal wall, and then enter into the abdominal cavity and retroperitoneal space. After maturation, which takes approximately three months, mating takes place; the male worm dies after mating and is absorbed by the host's body. Approximately one year after mating, the fertilized females migrate in the subcutaneous tissues adjacent to long bones or joints of the extremities. They then move towards the surface, resulting in blisters on the skin, generally on the distal lower extremity (foot). Within 72 hours, the blister ruptures, exposing one end of the emergent worm. The blister causes a very painful burning sensation as the worm emerges, and the sufferer will often immerse the affected limb in water to relieve the burning sensation. When a blister or open sore is submerged in water, the adult female releases hundreds of thousands of stage 1 guinea worm larvae, thereby contaminating the water. During the next few days, the female worm can release more larvae whenever it comes in contact with water, as it extends its posterior end through the hole in the host's skin. These larvae are eaten by copepods, and after two weeks (and two molts), the stage 3 larvae become infectious and, if not filtered from drinking water, will cause the cycle to repeat. Infected copepods can live in the water for up to 4 months. The male guinea worm is typically much smaller (12–29 mm or 0.47–1.14 in) than the female, which, as an adult, can grow to 60–100 cm (2–3 ft) long and be as thick as a spaghetti noodle. Infection does not create immunity, so people can repeatedly experience Dracunculiasis throughout their lives. In drier areas just south of the Sahara desert, cases of the disease often emerge during the rainy season, which for many agricultural communities is also the planting or harvesting season. Elsewhere, the emerging worms are more prevalent during the dry season, when ponds and lakes are smaller and copepods are thus more concentrated in them. Guinea worm disease outbreaks can cause serious disruption to local food supplies and school attendance. The infection can be acquired by eating a fish paratenic host, but this is rare. No reservoir hosts are known; that is, each generation of worms must pass through a human – or possibly a dog. Prevent people from drinking contaminated water containing the Cyclops copepod (water flea), which can be seen in clear water as swimming white specks. Drink water drawn only from sources free from contamination. Filter all drinking water, using a fine-mesh cloth filter like nylon, to remove the guinea worm-containing crustaceans. Regular cotton cloth folded over a few times is an effective filter. Filter the water through ceramic or sand filters. Develop new sources of drinking water without the parasites, or repair dysfunctional water sources. Treat water sources with larvicides to kill the water fleas. Prevent people with emerging Guinea worms from entering water sources used for drinking. Community-level case detection and containment is key. For this, staff must go door to door looking for cases, and the population must be willing to help and not hide their cases. Immerse emerging worms in buckets of water to reduce the number of larvae in those worms, and then discard that water on dry ground. Discourage all members of the community from setting foot in the drinking water source. Guard local water sources to prevent people with emerging worms from entering. There is no vaccine or medicine to treat or prevent Guinea worm disease. Once a Guinea worm begins emerging, the first step is to do a controlled submersion of the affected area in a bucket of water. This causes the worm to discharge many of its larva, making it less infectious. The water is then discarded on the ground far away from any water source. Submersion results in subjective relief of the burning sensation and makes subsequent extraction of the worm easier. To extract the worm, a person must wrap the live worm around a piece of gauze or a stick. The process can be long, taking anywhere from hours to a week. Gently massaging the area around the blister can help loosen the worm. This is nearly the same treatment that is noted in the famous ancient Egyptian medical text, the Ebers papyrus from 1550 BC. Some people have said that extracting a Guinea worm feels like the afflicted area is on fire. However, if the infection is identified before an ulcer forms, the worm can also be surgically removed by a trained doctor in a medical facility. Although Guinea worm disease is usually not fatal, the wound where the worm emerges could develop a secondary bacterial infection such as tetanus, which may be life-threatening—a concern in endemic areas where there is typically limited or no access to health care. Analgesics can be used to help reduce swelling and pain and antibiotic ointments can help prevent secondary infections at the wound site. At least in the Northern region of Ghana, the Guinea worm team found that antibiotic ointment on the wound site caused the wound to heal too well and too quickly making it more difficult to extract the worm and more likely that pulling would break the worm. The local team preferred to use something called "Tamale oil" (after the regional capital) which lubricated the worm and aided its extraction. Use of metronidazole or thiabendazole may make extraction easier, but also may lead to migration to other parts of the body. In 1986, there were an estimated 3.5 million cases of Guinea worm in 20 endemic nations in Asia and Africa. Ghana alone reported 180,000 cases in 1989. The number of cases has since been reduced by more than 99.999% to 22 in 2015 — in the four remaining endemic nations of Africa: South Sudan, Chad, Mali and Ethiopia. This is the lowest number of cases since the eradication campaign began. As of 2010, however, the WHO predicted it will be "a few years yet" before eradication is achieved, on the basis that it took 6–12 years for the countries that have so far eliminated Guinea worm transmission to do so after reporting a similar number of cases to that reported in southern Sudan (now South Sudan) in 2009. The World Health Organization is the international body that certifies whether a disease has been eliminated from a country or eradicated from the world. Former U.S. President Jimmy Carter's not-for-profit organization, the Carter Center, also reports the status of the Guinea worm eradication program by country. Endemic countries must report to the International Commission for the Certification of Dracunculiasis Eradication and document the absence of indigenous cases of Guinea worm disease for at least three consecutive years to be certified as Guinea worm-free by the World Health Organization. The results of this certification scheme have been remarkable: by 2007, Benin, Burkina Faso, Chad, Côte d'Ivoire, Kenya, Mauritania, Togo, and Uganda had stopped transmission, and Cameroon, Central African Republic, India, Pakistan, Senegal, Yemen were WHO certified. Nigeria was certified as having ended transmission in 2013, followed by Ghana in 2015. With the current eradication campaign the areas that dracunculiasis are found are shrinking. In the early 1980s, the disease was endemic in Pakistan, Yemen and 17 countries in Africa with a total of 3.5 million cases per year. In 1985, 3.5 million cases were still reported annually, but by 2008, the number had dropped to 5,000. This number further dropped to 1058 in 2011. At the end of 2013, South Sudan, Mali, Ethiopia and Chad still had endemic transmission. For many years the major focus was South Sudan (independent after 2011, formerly the southern region of Sudan), which reported 76% of all cases in 2013. Now all 4 countries with endemic cases look close to eliminating the disease. Logarithmic scale of reported human cases of guinea worm by year, 1989–2015 (2015 data is provisional). Data from Guinea Worm Eradication Program. In 1984, the WHO asked the United States Centers for Disease Control and Prevention (CDC) to spearhead the effort to eradicate dracunculiasis, an effort that was further supported by the Carter Center, former U.S. President Jimmy Carter's not-for-profit organization. In 1986, Carter and the Carter Center began leading the global campaign, in conjunction with CDC, UNICEF, and WHO. At that time the disease was endemic in Pakistan, Yemen and 17 countries in Africa, which reported a total of 3.5 million cases per year. Since humans are the principal host for Guinea worm, and there is no evidence that D. medinensis has ever been reintroduced to humans in any formerly endemic country as the result of non-human infections, the disease can be controlled by identifying all cases and modifying human behavior to prevent it from recurring. Once all human cases are eliminated, the disease cycle will be broken, resulting in its eradication. Carter made a personal visit to a Guinea-worm endemic village in 1988. He said, "Encountering those victims first-hand, particularly the teenagers and small children, propelled me and Rosalynn [his wife] to step up the Carter Center's efforts to eradicate Guinea worm disease." In 1991, the World Health Assembly (WHA) agreed that Guinea worm disease should be eradicated. At this time there were 400,000 cases reported each year. The Carter Center has continued to lead the eradication efforts, primarily through its Guinea Worm Eradication Program. In the 1980s, Carter persuaded President Zia al-Haq of Pakistan to accept the proposal of the eradication program, and by 1993, Pakistan was free of the disease. Key to the effort was, according to Carter, the work of "village volunteers" who educated people about the need to filter drinking water. Other countries followed, and by 2004, the worm was eradicated in Asia. In December 2008, The Carter Center announced new financial support totaling $55 million from the Bill & Melinda Gates Foundation and the United Kingdom Department for International Development. The funds will help address the higher cost of identifying and reporting the last cases of Guinea worm disease. Since the worm has a one-year incubation period, there is a very high cost of maintaining a broad and sensitive monitoring system and providing a rapid response when necessary. One of the most significant challenges facing Guinea worm eradication has been the civil war in southern Sudan, which was largely inaccessible to health workers due to violence. To address some of the humanitarian needs in southern Sudan, in 1995, the longest ceasefire in the history of the war, and the longest humanitarian cease-fire in history, was achieved through negotiations by Jimmy Carter. Commonly called the "Guinea worm cease-fire," both warring parties agreed to halt hostilities for nearly six months to allow public health officials to begin Guinea worm eradication programming, among other interventions. Public health officials cite the formal end of the war in 2005 as a turning point in Guinea worm eradication because it has allowed health care workers greater access to southern Sudan's endemic areas. In 2006, there was an increase to 15,539 cases, from 5,569 cases in 2005, as a result of better reporting from areas that were no longer war-torn. The Southern Sudan Guinea Worm Eradication Program (SSGWEP) has deployed over 28,000 village volunteers, supervisors and other health staff to work on the program full-time. The SSGWEP was able to slash the number of cases reported in 2006 by 63% to 5,815 cases in 2007. Since 2011, at the time that South Sudan became independent, its northern neighbor Sudan had reported no endemic cases of dracunculiasis . Sporadic insecurity or widespread civil conflict could at any time ignite, thwarting eradication efforts. The remaining endemic communities in South Sudan are remote, poor and devoid of infrastructure, presenting significant hurdles for effective delivery of interventions against disease. Moreover, residents in these communities are nomadic, moving seasonally with cattle in pursuit of water and pasture, making it very difficult to know where and when transmission occurred. The peak transmission season coincides with the rainy season, hampering travel by public health workers. One remaining area in West Africa outside of Ghana remains challenging to ending Guinea worm: northern Mali, where Tuareg rebels have made some affected areas unsafe for health workers. Four of Mali's regions—(Kayes, Koulikoro, Ségou, and Sikasso)—have eliminated dracunculiasis, while the disease is still endemic in the country's other four regions (Gao, Kidal, Mopti, and Timbuktu). Late detection of two outbreaks, due to inadequate surveillance resulted in a meager 36% containment rate in Mali in 2007. The years 2008 and 2009 were more successful, however, with containment rates of 85% and 73% respectively. The civil war prevented accurate information from being gathered in northern Mali in 2012. From June 2006 to March 2008, there had been no cases reported in Ethiopia. Before 2010, Chad had not reported any indigenous cases of guinea worm in over 10 years. In Ghana, after a decade of frustration and stagnation, in 2006 a decisive turnaround was achieved. Multiple changes can be attributed to the improved containment and lower incidence of dracunculiasis: better supervision and accountability, active oversight of infected people daily by paid staff, and an intensified public awareness campaign. After Jimmy Carter's visit to Ghana in August 2006, the government of Ghana declared Guinea worm disease to be a public health emergency. The overall rate of contained cases has increased in Ghana from 60% in 2005, to 75% in 2006, 84% in 2007, 85% in 2008, 93% in 2009, and 100% in 2010. On 30 January 2012 the WHO meeting at the Royal College of Physicians in London launched the most ambitious and largest coalition health project ever, known as London Declaration on Neglected Tropical Diseases which aims to end/control dracunculiasis by 2020, among other neglected tropical disease. This project is supported of all major pharmaceutical companies, the Bill & Melinda Gates Foundation, the governments of the United States, United Kingdom DFID and United Arab Emirates and the World Bank. In 2015 22 cases of dracunculiasis were reported: 9 in Chad, 3 in Ethiopia, 5 in Mali and 5 in South Sudan. This is an 83% reduction from 2014. The proportion of people contained (i.e. treated and isolated from drinking water sources early enough to remove the risk they can contaminate the water source) is 36%, compared to 73% in 2014. That means 14 cases have not been contained in 2015, compared to 34 cases in 2014. 9 of these 14 cases not contained were in Chad. A significant change from 2014 is the increased effort being used to identify and treat infected dogs—mainly in Chad where the vast majority of cases of dogs hosting the worm have been found, but also significantly in Ethiopia. In 2015, 483 infected dogs were identified and treated in Chad — more than 20 times the number reported in humans worldwide. This is more than 4 times larger than the number treated in 2014 (114 dogs). A major factor in this increase is probably the financial reward started in January for reporting an infected dog. 68% of dogs treated were also contained, compared to 40% in 2014. Dogs are believed to be the major source of the parasite infecting humans in Chad. 15 dogs outside Chad have also been identified and treated, as well 5 cats and 1 baboon. The August Carter Center report predicts that Chad may be the last country that eliminates dracunculiasis, and reports on further ongoing research into the relationship between the parasite and dogs there, and some different treatments for dogs. It also predicts that the large increase in monitoring, treating and containing dogs this year will not affect the number of human cases for many months due to the 1 year incubation period of the disease. In August 2015, when discussing his diagnosis of melanoma metastasized to his brain, Jimmy Carter stated that he hopes the last Guinea worm dies before he does. The pain caused by the worm's emergence—which typically occurs during planting and harvesting seasons—prevents many people from working or attending school for as long as three months. In heavily burdened agricultural villages fewer people are able to tend their fields or livestock, resulting in food shortages and lower earnings. A study in southeastern Nigeria, for example, found that rice farmers in a small area lost US$20 million in just one year due to outbreaks of Guinea worm disease. Guinea worm has been found in calcified Egyptian mummies. An Old Testament description of "fiery serpents" may have been referring to Guinea worm: "And the Lord sent fiery serpents among the people, and they bit the people; and much people of Israel died." (Numbers 21:4–9). The 2nd century BC, Greek writer Agatharchides, described this affliction as being endemic amongst certain nomads in what is now Sudan and along the Red Sea. The unusually high incidence of dracunculiasis in the city of Medina led to it being included in part of the disease's scientific name "medinensis." A similar high incidence along the Guinea coast of West Africa gave the disease its more commonly used name. Guinea worm is no longer endemic in either location. The Russian scientist Alexei Pavlovich Fedchenko (1844–1873) during the 1860s while living in Samarkand was provided with a number of specimens of the worm by a local doctor which he kept in water. While examining the worms Fedchenko noted the presence of water fleas with embryos of the guinea worm within them. In modern times, the first to describe dracunculiasis and its pathogenesis was the Bulgarian physician Hristo Stambolski, during his exile in Yemen (1877–1878). His theory was that the cause was infected water which people were drinking. Dracunculiasis once plagued a wide band of tropical countries in Africa and Asia. Its Latin name, Dracunculus medinensis ("little dragon from Medina"), derives from its one-time high incidence in the city of Medina, and its common name, Guinea worm, is due to a similar past high incidence along the Guinea coast of West Africa; both of these locations are now free of Guinea worm. In the 18th century, Swedish naturalist Carl Linnaeus identified D. medinensis in merchants who traded along the Gulf of Guinea (West African Coast), hence the name Guinea worm. A very similar or possibly the same worm has been found in dogs. It is unclear if dog and human infections are related. It is possible that dogs may be able to spread the disease to people, that a third organism may be able to spread it to both dogs and people, or that this may be a different type of Dracunculus. 1 2 3 4 5 6 7 8 "Dracunculiasis (guinea-worm disease) Fact sheet N°359 (Revised)". World Health Organization. March 2014. Retrieved 18 March 2014. 1 2 3 4 5 6 7 8 Greenaway, C (Feb 17, 2004). "Dracunculiasis (guinea worm disease).". CMAJ : Canadian Medical Association. 170 (4): 495–500. PMC 332717 . PMID 14970098. 1 2 Cairncross, S; Tayeh, A; Korkor, AS (Jun 2012). "Why is dracunculiasis eradication taking so long?". Trends in parasitology. 28 (6): 225–30. doi:10.1016/j.pt.2012.03.003. PMID 22520367. 1 2 Junghanss, Jeremy Farrar, Peter J. Hotez, Thomas (2013). Manson's tropical diseases. (23rd ed.). Oxford: Elsevier/Saunders. p. e62. ISBN 9780702053061. ↑ "Parasites – Dracunculiasis (also known as Guinea Worm Disease) Eradication Program". CDC. November 22, 2013. Retrieved 19 March 2014. ↑ Cook, Gordon (2009). Manson's tropical diseases. (22nd ed.). [Edinburgh]: Saunders. p. 1506. ISBN 9781416044703. 1 2 "Guinea Worm Cases Left in the World". Carter Center. Jan 12, 2015. Retrieved 14 March 2015. ↑ "The Last Days of Guinea Worm". Oregon Public Broadcasting. Retrieved 6 June 2016. 1 2 3 4 5 6 7 8 "Guinea Worm Eradication Program". Carter Center. Retrieved 2011-03-01. 1 2 3 4 5 6 7 8 Tropical Medicine Central Resource. "Dracunculiasis". Uniformed Services University of the Health Sciences. Retrieved 2008-07-15. 1 2 3 4 Barry M (June 2007). "The tail end of guinea worm — global eradication without a drug or a vaccine". N. Engl. J. Med. 356 (25): 2561–4. doi:10.1056/NEJMp078089. PMID 17582064. ↑ Junghanss, Jeremy Farrar, Peter J. Hotez, Thomas (2013). Manson's tropical diseases. (23rd ed.). Oxford: Elsevier/Saunders. p. 763. ISBN 9780702053061. ↑ "North American Guinea Worm". Michigan Department of Natural Resources. Retrieved 10 December 2015. 1 2 3 Centers for Disease Control and, Prevention (25 October 2013). "Progress toward global eradication of dracunculiasis—January 2012 – June 2013.". MMWR. Morbidity and mortality weekly report. 62 (42): 829–33. PMID 24153313. ↑ Z. Harrat; R. Halimi (2009). "La dracunculose d'importation : quatre cas confirmés dans le sud algérien" [Imported dracunculiasis: four cases confirmed in the south of Algeria] (PDF). Bulletin de la Société de pathologie exotique (in French). 102 (2): 119–122. doi:10.3185/pathexo3352. PMID 19583036. 1 2 3 4 "Dracunculiasis". World Health Organization. Retrieved 2010-07-12. 1 2 G. D. Schmidt; L S. Roberts (2009). Larry S. Roberts; John Janovy, Jr., eds. Foundations of Parasitology (8th ed.). McGraw-Hill. pp. 480–484. ISBN 978-0-07-128458-5. 1 2 3 4 5 6 "Fact Sheet:Dracunculiasis—Guinea Worm Disease". CDC. 2008-07-15. Retrieved 2010-07-12. ↑ Hopkins, D.; Richards Jr, F.; Ruiz-Tiben, E.; Emerson, P.; Withers Jr, P. (2008). "Dracunculiasis, onchocerciasis, schistosomiasis, and trachoma". Annals of the New York Academy of Sciences. 1136: 45–52. Bibcode:2008NYASA1136...45H. doi:10.1196/annals.1425.015. PMID 17954680. ↑ "World moves closer to eradicating ancient worm disease". World Health Organization. 2007-03-27. Retrieved 2008-07-15. ↑ McNeil, DG (2006-03-26). "Dose of Tenacity Wears Down a Horrific Disease". New York Times. Retrieved 2008-07-15. 1 2 Centers for Disease Control and Prevention (CDC) (December 1993). "Recommendations of the International Task Force for Disease Eradication". MMWR Recomm Rep. 42 (RR–16): 1–38. PMID 8145708. ↑ WHO (7 May 2010). "Dracunculiasis eradication – global surveillance summary, 2009" (PDF). Wkly Epidemiol Rec. World Health Organization. 85 (19): 166–175. ↑ "WHO certifies seven more countries as free of guinea-worm disease". World Health Organization. Retrieved 2010-05-14. ↑ "Activities by Country—Guinea Worm Eradication Program". Carter Center. Retrieved 2010-03-16. ↑ CDC (2000-10-11). "Progress Toward Global Dracunculiasis Eradication, June 2000". MMWR Morb. Mortal. Wkly. Rep. 49: 731–5. PMID 11411827. ↑ The Carter Center. "Activities by Country—Guinea Worm Eradication Program". The Carter Center. Retrieved 2010-03-16. ↑ "WHO certifies Ghana free of dracunculiasis". World Health Organization. Retrieved 2016-01-07. 1 2 3 Drisdelle R. Parasites. Tales of Humanity's Most Unwelcome Guests. Univ. of California Publ., 2010. p. 197. ISBN 978-0-520-25938-6. 1 2 3 4 5 6 7 8 9 10 11 12 13 14 15 16 17 18 19 20 21 22 23 24 25 "Guinea Worm Disease: Case Countdown". Carter Center. 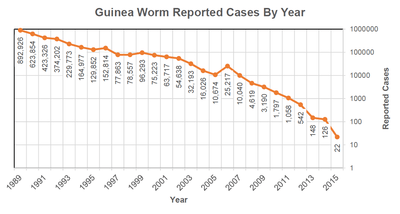 ↑ ""Number of Reported Cases of Guinea Worm Disease by Year: 1989–2015*"" (PDF). Guinea Worm Eradication Program. 2016-01-06. Retrieved 2016-01-10. ↑ "International Task Force for Disease Eradication—Original Members (1989–1992).". Carter Center. Retrieved 2008-07-17. ↑ BIMI, L.; A. R. FREEMAN; M. L. EBERHARD; E. RUIZ-TIBEN; N. J. PIENIAZEK (10 May 2005). "Differentiating Dracunculus medinensis from D. insignis, by the sequence analysis of the 18S rRNA gene" (PDF). Annals of Tropical Medicine and Parasitology. 99 (5): 511–517. doi:10.1179/136485905x51355. Retrieved 18 May 2012. ↑ Carter, Jimmy; Lodge, Michelle (2008-03-31). "A Village Woman's Legacy." (PDF). TIME. Retrieved 2008-07-15. ↑ "2006 Gates Award for Global Health: The Carter Center". Carter Center. 2006. Retrieved 2010-03-08. 1 2 "Guinea Worm Cases Hit All-Time Low: Carter Center, WHO, Gates Foundation, and U.K. Government Commit $55 Million Toward Ultimate Eradication Goal". Carter Center. Retrieved 2008-12-08. 1 2 3 "Sudan". Carter Center. Retrieved 2008-07-15. ↑ "The Guinea worm, and the havoc it wreaks, has nearly been wiped out". The Economist. 3 February 2016. Retrieved 4 February 2016. ↑ Hopkins, Donald R.; Withers, P. Craig, Jr. (2002). "Sudan's war and eradication of dracunculiasis". Lancet. 360: s21–2. doi:10.1016/S0140-6736(02)11806-X. 1 2 Hopkins DR; Ruiz-Tiben E; Downs P; Withers PC Jr.; Maguire JH (2005-10-01). "Dracunculiasis Eradication: The Final Inch". American Journal of Tropical Medicine and Hygiene. 73 (4): 669–675. PMID 16222007. 1 2 3 4 Hopkins DR, Ruiz-Tiben E, Downs P, Withers PC, Roy S (October 2008). "Dracunculiasis eradication: neglected no longer". Am. J. Trop. Med. Hyg. 79 (4): 474–9. PMID 18840732. ↑ WHO (2 May 2008). "Dracunculiasis eradication" (PDF). Wkly Epidemiol Rec. World Health Organization. 83 (18): 159–167. PMID 18453066. 1 2 WHO Collaborating Center for Research, Training and Eradication of Dracunculiasis (March 12, 2010). "GUINEA WORM WRAP-UP #195" (PDF). Centers for Disease Control and Prevention (CDC). "Guinea worm wrap-up 195, 12 March 2010" (PDF). Carter Center. Retrieved 2010-03-16. ↑ Centers for Disease Control and Prevention (CDC) (October 2008). "Update: progress toward global eradication of dracunculiasis, January 2007 – June 2008". MMWR Morb. Mortal. Wkly. Rep. 57 (43): 1173–6. PMID 18971919. 1 2 WHO Collaborating Center for Research, Training and Eradication of Dracunculiasis (January 7, 2011). "GUINEA WORM WRAP-UP #202" (PDF). Centers for Disease Control and Prevention (CDC). ↑ Uniting to Combat Neglected Tropical Diseases (30 January 2012). "London Declaration on Neglected Tropical Diseases" (PDF). Uniting to Combat NTDs. Retrieved 2013-05-06. ↑ WHO (3 February 2012). "WHO roadmap inspires unprecedented support to defeat neglected tropical diseases". World Health Organization. Retrieved 2013-05-06. ↑ VOX (20 August 2015). "President Jimmy Carter's Amazing Last Wish". Retrieved 2015-08-20. ↑ "Guinea Worm Infection (Dracunculiasis)". The Imaging of Tropical Diseases. International Society of Radiology. 2008. Retrieved December 2, 2009. 1 2 Eberhard, ML; Ruiz-Tiben, E; Hopkins, DR; Farrell, C; Toe, F; Weiss, A; Withers PC, Jr; Jenks, MH; Thiele, EA; Cotton, JA; Hance, Z; Holroyd, N; Cama, VA; Tahir, MA; Mounda, T (January 2014). "The peculiar epidemiology of dracunculiasis in Chad.". The American journal of tropical medicine and hygiene. 90 (1): 61–70. doi:10.4269/ajtmh.13-0554. PMID 24277785. "Guinea Worm Disease Eradication Program". Carter Center. Tropical Medicine Central Resource: "Guinea Worm Infection (Dracunculiasis)"